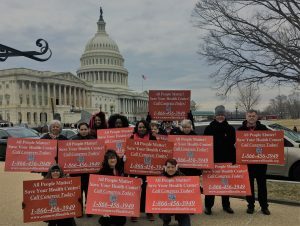 Health center activists descend on Capitol Hill for “Code Red” day on Capitol Hill. What a difference a year makes. On this exact day 1 year ago the primary care funding cliff took effect and Community Health Centers were launched into uncertainty. Congress failed to reauthorize funding for the Community Health Center Fund (CHCF), opening the door to crippling service interruptions for patients and confusion in health systems across the U.S. The stakes were indeed high. The U.S. Department of Health and Human Services projected that the national impact of the loss of funding would close 2,800 health center locations, eliminate more than 50,000 jobs, and result in loss of access to care for more than 9 million patients. There was certainly bipartisan will in motion to fix the funding cliff. Indeed, legislation to extend health center funding for 5 years was introduced in the House and Senate, but a crowded legislative calendar and arguments about offsets effectively hampered progress. Meanwhile the ranks of health center advocates grew and prodded Members of Congress with thousands of emails, phone calls and office visits. The media also paid attention with headlines about the health center funding cliff in USA Today, The Wall Street Journal, U.S. News & World Report, The Atlanta Journal-Constitution, Kaiser Health News and scores of state newspapers. Health center advocates also descended on Capitol Hill for a “code red” news conference with bipartisan Members of Congress in early February, months after the expiration of mandatory funding. In the end, Congress finally acted and the cliff was temporarily resolved in February with the Bipartisan Budget Act. The move was a welcome relief to health centers, many of whom were already affected in some way — hiring freezes, losing a much needed dentist or provider in the recruiting process or engaged in the final stages of implementing plans to ensure their fiscal survival with staff layoffs, site closures or service cutbacks. It was a rough year. Few things are certain, but for health centers it seems a sure bet that the numbers of patients seeking care at health centers will grow (they now serve 28 million people nationwide). It’s also certain that health center advocates can’t afford to wait until next October 1, 2019 to fight for their fiscal survival. We are going to need to work with all of our champions on Capitol Hill starting in the New Year to make sure the funding cliff doesn’t happen again.